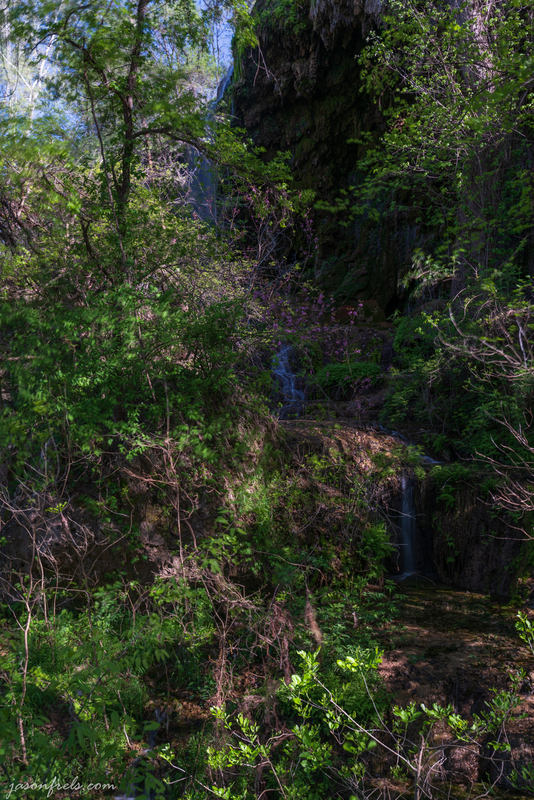 Sunday afternoon I hiked the river trail at Colorado Bend State Park and then on to Gorman Falls. From the parking lot in the main camping area this hike is about 3.8 miles to Gorman Falls, for a total of 7.6 miles round-trip hike. 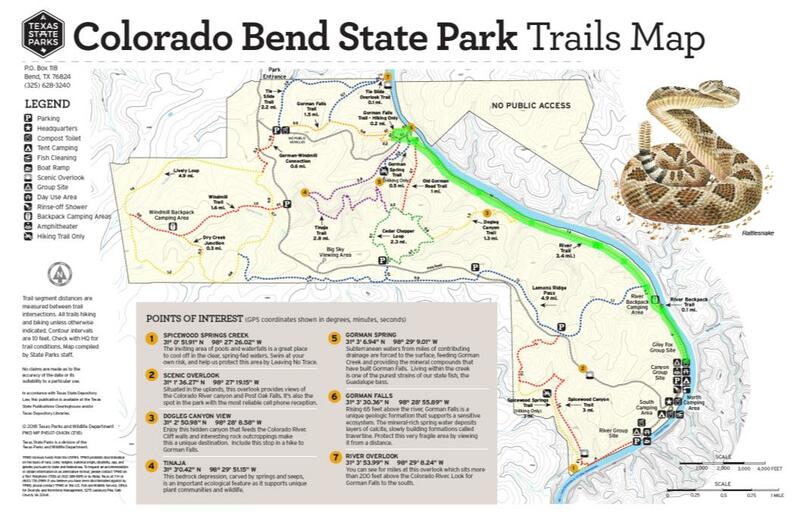 Below is the trails map from the state park on which I have added green highlighting showing the trail that I hiked. I parked my car and started my hike in the lower right part of the map with Gorman Falls being up at the other end. I did not see a big rattlesnake as shown on the map. 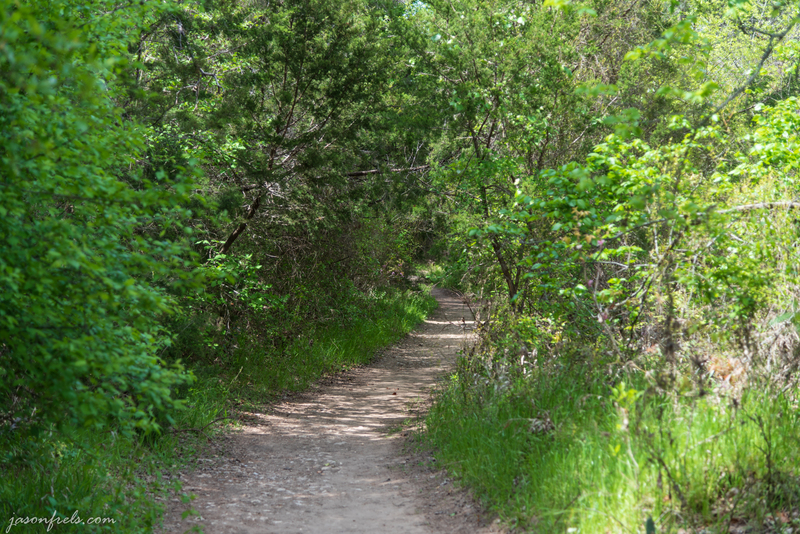 I have hiked this trail before and come back because it is a peaceful hike and I am usually alone on the hike for long periods of time along the trails, though when I do meet people they are friendly. 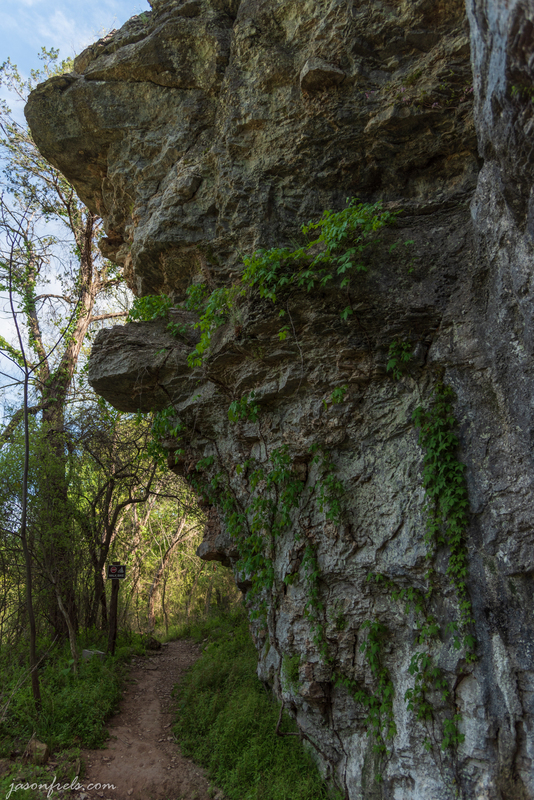 Most of the River Trail hike is shaded by tree cover and over mostly even ground, though there are a few places where you have to climb along some rocky ledges, though there is a cable to hold on to. Below is a photo showing the trail winding into the woods. Eventually the trail winds along the bottom of a cliff where there are a few caves. This part of the trail is not difficult; you just have to watch your step in a few places. 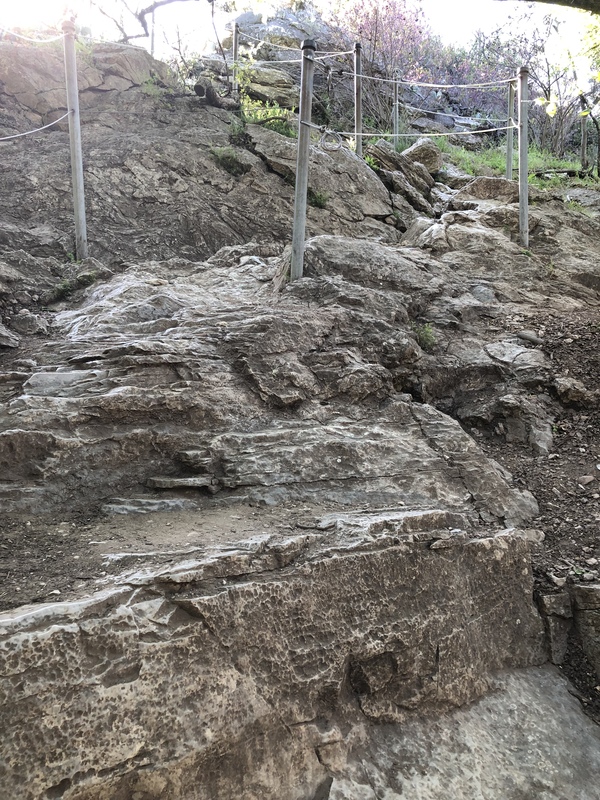 Below is a photo of the trail near one of the cliffs (the river is to the left). 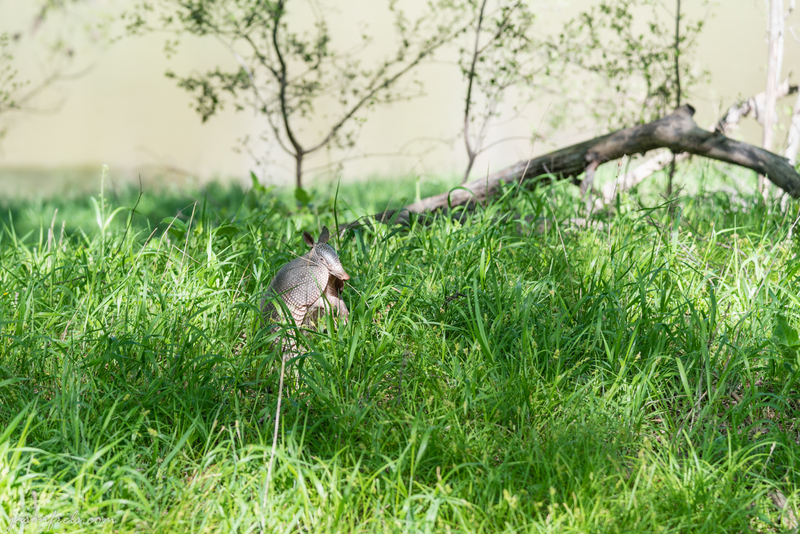 It is not uncommon to see armadillos roaming around in the park. I see them nearly every time I come out to Colorado Bend. The armadillos seem to be mostly oblivious to the presence of people. I don’t know if it is because they don’t notice us or if they are not worried about us. 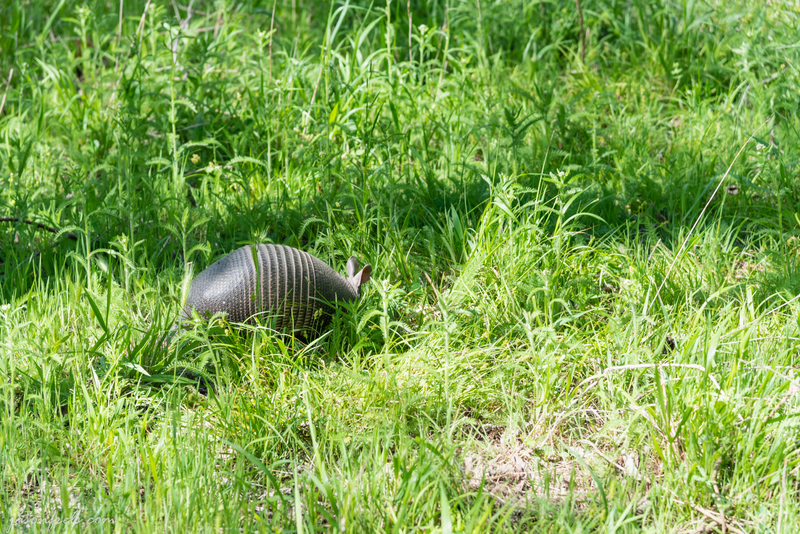 I was walking along, heard some rustling in the grass, turned to look, and found that I was a few feet away from this armadillo and it didn’t seem to notice that I was there. He just continued to root around in the grass. Another hiker eventually disturbed it enough such that it stood up and looked around. See the photos below. In the second photo above, the river is in the background. I saw another armadillo later, but it wasn’t as photogenic as the first one. Eventually the River Trail gets to the Gorman Falls trail. This trail involves quite a bit of climbing up and down a rocky area to get to the bottom of the falls. On the steeper parts, there is a cable system to hold onto to keep from slipping. Eventually you get to a well shaded area with an observation platform that is not far from the river bank. There is a lot of vegetation around the falls and it can be a bit difficult to see in places. Getting too close to the falls is prohibited to preserve nature. The below photo shows the left side of the falls in between tree branches. It is very difficult to capture the entire falls in a picture from top to bottom. On the right side of the falls there is a rocky area you can climb upon to get a view of that side of the falls. I set up my tripod in this area to shoot a few long exposures. The photo below is from these rocks, looking down a bit toward the bottom of the falls. There is a bit of flare from the sunlight in the upper right corner of the image. Many of the tree branches are blurry from blowing in the breeze. I found that there was so much dynamic range of light in this scene that I decided that I would do an HDR merge to get detail in the darker areas without blowing out the highlights. The above photo and the one that follows are HDR merges of 6s, 12s, and 25s exposures using a 10-stop ND filter. Behind the water there are some green moss-covered rocks that I have always found interesting, with the shapes giving sort of a creepy vibe to the rocks. Below is a close-up of those rocks and is also an HDR merge to preserve shadow detail. The sunlight through the trees and cliffs also created a striped pattern across the falling water that showed up in the long exposure. I stayed here for a while shooting photos, then packed up my gear and climbed back up the rocks to hike back to my car. It was a fantastic afternoon with the weather being cool and breezy. 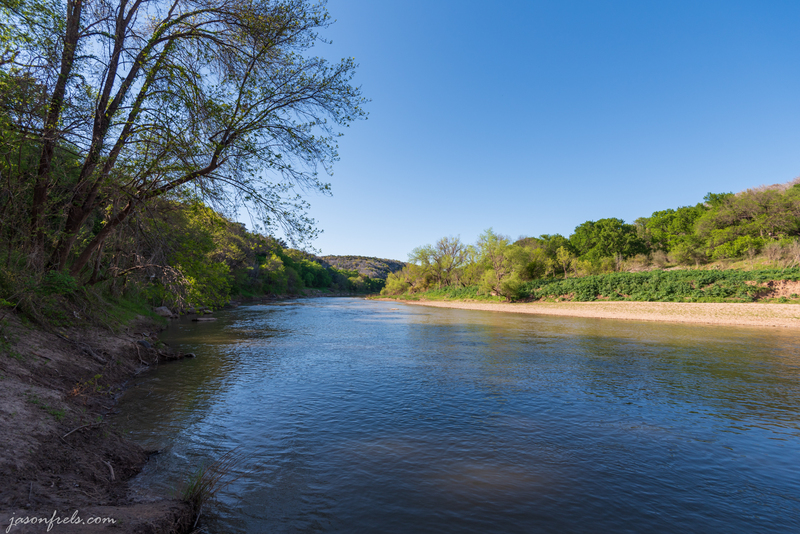 Colorado Bend State Park is a long way from any town and the environment is mostly free of man-made sounds aside from the occasional airplane. And as an added bonus, I don’t get any cellular service in this park. So, I had the nice peaceful hike that I really needed. This continues to be one of my favorite parks to go to hike and unwind even though it is about an hour drive from my house. There are many other trails here and I highly recommend the park for day hiking. Thanks for reading. Leave a comment below if you like. All you have to do is fly to Austin and drive out west a bit. Armadillos have some serious digging claws and I wouldn’t want to be on the receiving end of that. They do like to get out on the highway and get hit by cars. I hit one in a Civic once and it scared the something out of me. 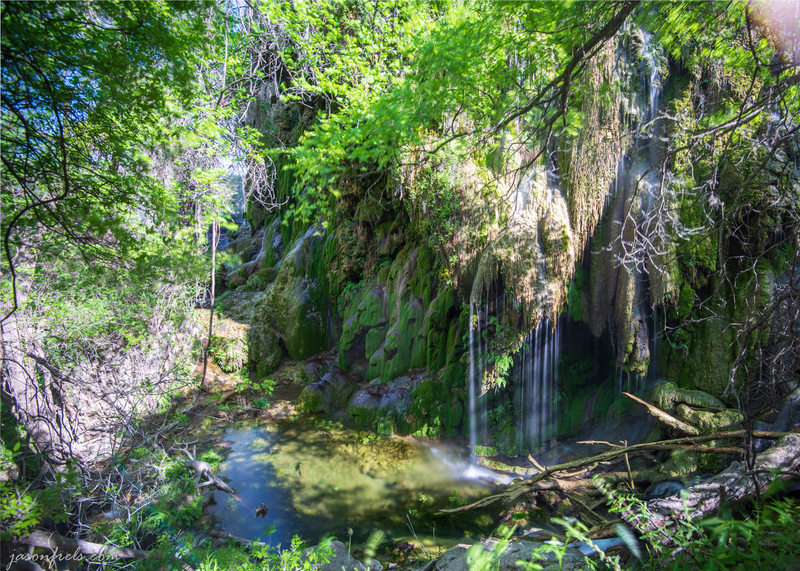 You probably have lots of nice hikes out your way in Las Vegas. Oh yes, tons of hikes around here. Armadillos are like deer apparently, gotta walk on the road and get the crunch! The mossy rock and Colorado river pictures are my favorite. Good for you for making quite the hike! They will dig a serious hole in the ground. I used to see one in my front yard, but he ran off somewhere. Really?! This one seems to go from yard fence to fence real late at night. I don’t have a dog, but perhaps he doesn’t get in the years because he knows there are dogs in some. 😏 Smart! This one of my favorite hikes. There are a lot of other hiking trails in this park that I need to go check out. 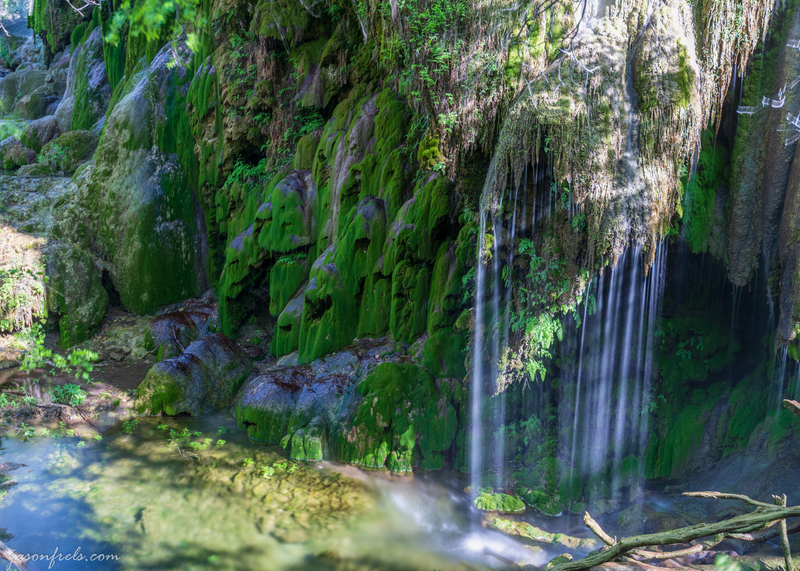 I’ve been up the Spicewood springs trail and that is scenic with lots of small waterfalls. Haven’t really been on the others. I have been out there late at night to shoot stars a few times as well. Every time I have tried to get a camping reservation out there is has been full. though. 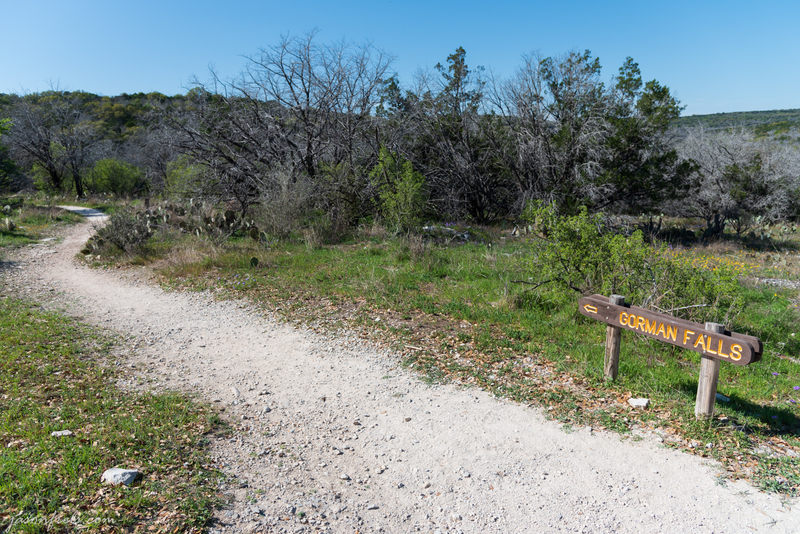 Spicewood Springs trail is one trail I have been on yet. I am looking forward to getting back there soon. I might try to get a camping reservation but I guess I might have to wait. Looks like a very nice hike, with lovely scenery. Armadillos are certainly interesting looking creatures, and don’t live in my neck of the woods. It is a nice hike. Might be my favorite place to hike. It just takes an hour for me to drive there. Armadillos are quite famous around here for being hit by cars as they often wander out on the highway. You often see their carcasses on the side of the road. Doesn’t seem to affect their numbers though and this probably makes the vultures happy. They may not like colder climates, though I don’t know that much about them. They are funny looking animals and harmless, I think. I have read that in prehistoric times there were giant armadillos. I don’t know why they went away. Beautiful photos. You seem to be a wizard with your camera. Great country, too. I briefly lived on the shores of Buchanan Dam, back in the 70s. I saw plenty of armadillos, but most of them were dead by the side of the road. They do like to run out into traffic, but there seems to be no shortage of them. I would probably live out that way, close to one of the lakes, if the commute to Austin wasn’t so long from out there.